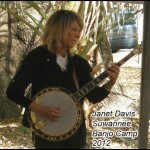 Janet Davis through our catalogs and “Janet Davis Music Company” (JDMC) has been helping banjo, mandolin, guitar, fiddle/violin, Dobro, and bass players to better and more accurately play and understand their music for more than 30 years. Janet Davis Publishing, Downloadable Music and Instruction ONLINE for the bluegrass musician is our latest effort to bring Janet’s instruction in an easy to use and affordable format. You will be able to download Songs in Tablature with Slow/Fast Recordings, Books with Audio and Video Lessons, “How To” Articles, Instant Downloads, Entertainment DVDS, MP3s, MP4s and More for Beginning through Advanced Players. Topics will cover a wide spectrum, including soloing, improvising, playing backup, historical information, theory, and advice. Tabs, recordings, instruction, tips and other information from other well known bluegrass musicians will be incorporated as well. By popular request we began this website, “Janet Davis Publishing” with over 500 of Janet’s original Tabs and Recordings available for download. As we continue to build the website magazine articles, books , mp3s, workshops, and videos by Janet will be added. Note: This site will be continuously adding new material as time progresses. Janet Davis started Janet Davis Music Company (JDMC) by selling tablature and recordings of the tablature through a catalog. These “tabs” of all Bluegrass and many other styles of music for the 5-String Banjo, Mandolin, Guitar, Dobro and other instrument were considered the best, most accurate and easy to play arrangements available. There were many disappointed customers when Janet discontinued selling tabs and recordings in the early 1990’s. We have now been able to scan the tabs into our computer and digitize the cassette tapes to mp3s and make them available once more as downloads. The complete list of all tabs and recordings will take a while to complete, but we will make them all available on this website. Check back often to see new titles as they are added.